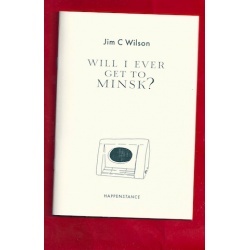 Will I Ever Get to Minsk? and a Sunday expanse of wilderness. bit into its salty whiteness. firm, and coloured like a bruise. but Mr Hyde was there, behind each tree. South Seas until he reached his final quay. and Mr Hyde was there, behind each tree. Largely regular in its triolet form, “R L S” employs iambic pentameter (an unstressed syllable followed by a stressed syllable five times per line) with a phrase repeated in the first, fourth and seventh lines and another within the second and final lines. The poem also follows the triolet’s end-rhyme pattern. It’s a skilful use of the form to convey both the innocence of childhood as well as the sense of menace beneath the surface in only eight lines. the living’s lean, the boats are few. as men remember vanished crews. to be precise – de Milo. twenty-two syllables, five short lines. there, with that spondee, slow TB? wondering if I’ll ever get to Minsk. These are highly accessible poems – wistful and nostalgic, reminding us that we have our own Minsk, a place we may never reach.